ImageJ x64 is an intersting Java based image processing application inspired by NIH Image for the Macintosh. It runs, either as an online applet or as a downloadable application, on any computer with a Java 1.1 or later virtual machine. It can display, edit, analyze, process, save and print 8-bit, 16-bit and 32-bit images. It can read many image formats including TIFF, GIF, JPEG, BMP, DICOM, FITS and "raw". It supports "stacks", a series of images that share a single window. It is multithreaded, so time-consuming operations such as image file reading can be performed in parallel with other operations. ImageJ x64 was designed with an open architecture that provides extensibility via Java plugins. 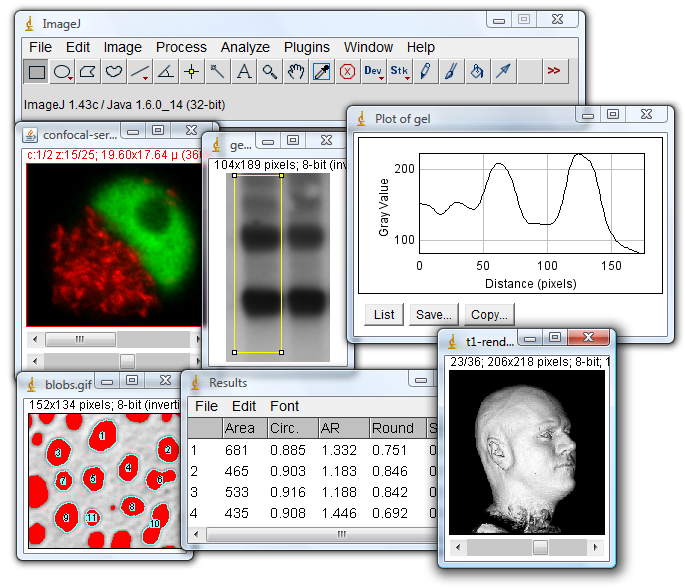 Custom acquisition, analysis and processing plugins can be developed using ImageJ's x64 built in editor and Java compiler. User-written plugins make it possible to solve almost any image processing or analysis problem. · ImageJ x64 runs on Linux, Mac OS 9, Mac OS X, Windows, and the Sharp Zaurus PDA. · ImageJ x64 and its Java source code are freely available and in the public domain. No license is required. · ImageJ x64 has a large and knowledgeable worldwide user community. More than 1700 users and developers subscribe to the ImageJ mailing list. · Extend ImageJ x64 by developing plugins using ImageJ's built in text editor and Java compiler. More than 500 plugins are available. · Use ImageJ x64as a image processing toolkit (class library) to develop applets, servlets or applications. · ImageJ x64 is the world's fastest pure Java image processing program. It can filter a 2048x2048 image in 0.1 seconds (*). That's 40 million pixels per second!